Will Stanford Enforce Its Ethics Policy Regarding Prof. Brock-Utne, M.D.? Stanford Professor of Anesthesia John G. Brock-Utne, M.D., PhD. 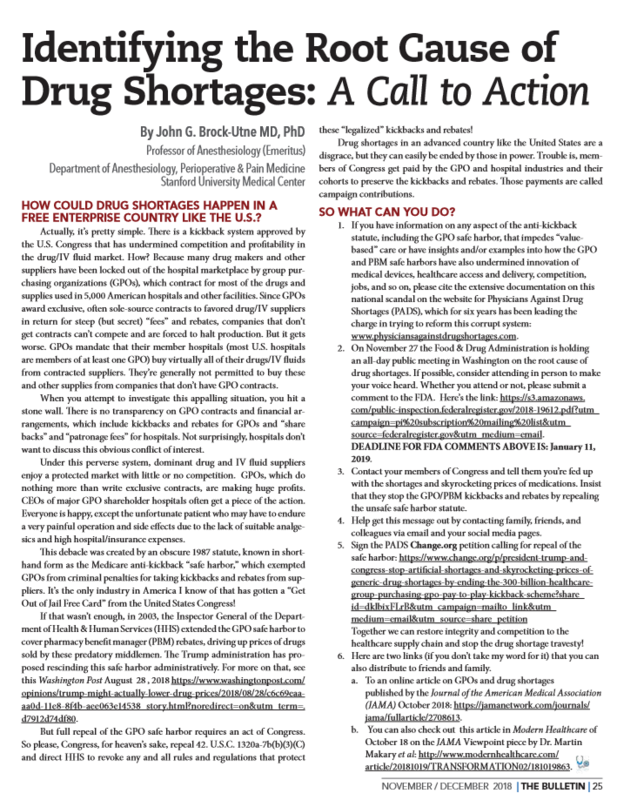 authored an article in the November/December 2018 issue of Bay-area medical society publication The Bulletin making the case that hospital drug shortages were because many drug makers and other suppliers are locked out of the marketplace. What Brock-Utne didn’t reveal is that he has received payments of $48,245 over five years from drug makers and other suppliers, including from pharmaceutical manufacturers Grifols S.A.and Myland Specialty L.P.
Checks and Balances Project sent an email to Professor Brock-Utne on January 16, 2019, that asked him about his article in The Bulletin and the payments. We received no reply. We sent a letter the next day to Stanford University President Marc Tessier-Lavigne and Ronald Pearl, chairman of the Anesthesia Department, asking them to remind Professor Dr. Brock-Utne of his disclosure responsibilities under Section V.D.3 of the Stanford Industry Interactions Policy. Click on the image below or HERE to read the entire letter. 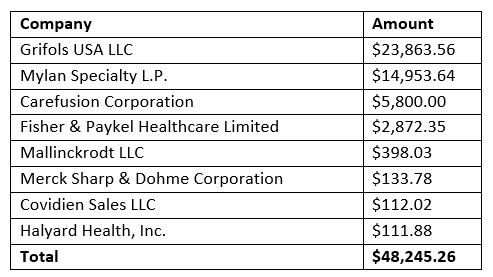 Our research has found that Dr. Brock-Utne has received more than $48,000 from drug and medical device companies since 2013, according to the Centers for Medicare and Medicaid Services Open Payments database. The payments were described as speaking, training or education engagements, consulting fees or education. 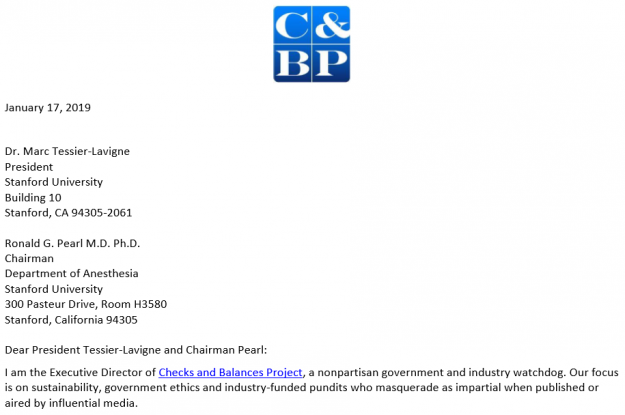 For years, Checks and Balances Project has examined how industry-funded pundits are published and aired by influential media. Our True Ties petition led to a call by the New York Times Ombudsman for greater disclosure by op-ed writers. Our investigation exposing how the hotel lobby used university professors to conduct research with predetermined conclusions resulted in Florida International University withdrawing its grant application. Since October 2018, we’ve been looking into an organization called Physicians Against Drug Shortages and its media campaign against Group Purchasing Organizations (GPOs) that negotiate bulk prices of drugs and medical supplies for hospitals and other healthcare providers. Dr. Brock-Utne is a PADS co-chair. Another co-chair is Eric Edwards, co-founder of Kaleo Pharmaceuticals, which was the subject of investigation by a U.S. Senate subcommittee and 60 Minutes after increasing the price of its overdose antidote injector from $690 in 2014 to $4,500. The executive director of PADS, Phillip Zweig, was a former communications manager of Retractable Technologies, Inc. (RTI), a top five manufacturer of safety needle devices. Like Zweig and PADS, RTI appears to have a long-history of opposing GPOs. Stanford Professor John Brock-Utne has a right to his opinion. When he asks the question, “How Could Drug Shortages Happen in a Free Enterprise Country Like the U.S.,” he may believe that the pharmaceutical and medical device industries can solve what he has witnessed in hospitals. But if he believes it or not, he needs to be transparent about the payments he has received from drug and medical supply companies. 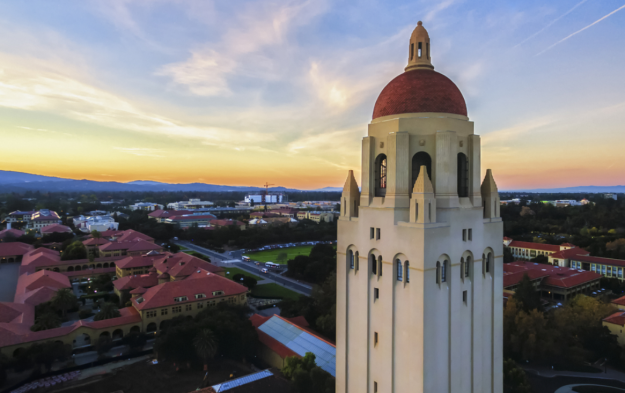 Stanford University has a stated policy that addresses transparency and disclosure. Scott Peterson is executive director of Checks and Balances Project, an investigative watchdog blog that seeks to hold government officials, lobbyists and corporate management accountable to the public. Funding for C&BP is provided by Renew American Prosperity and individual donors.